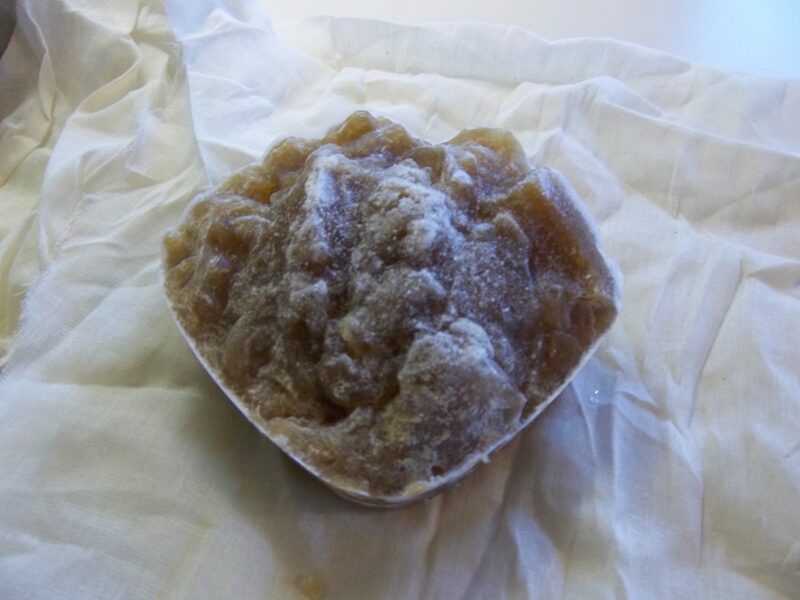 For those of you not in the know, in England a dumpling is a small ball of suet dough that has been poached in water, milk, stock, soup or stew. Dumplings have been around for a while, and started life just a mixture of flour and water. During the Roman invasion and occupancy, somewhere around AD50, their own version of the dumpling was introduced that was made of lentils rather than flour. They didn’t catch on. As time passed, our own British dumpling began to get a little more complex: milk was added along with extra ingredients and became larger and larger until it had to wrapped in some cloth. It was at this point the pudding was born. I’m not going to talk about puddings in this post as they need their own one themselves. The British then became famous for their puddings. 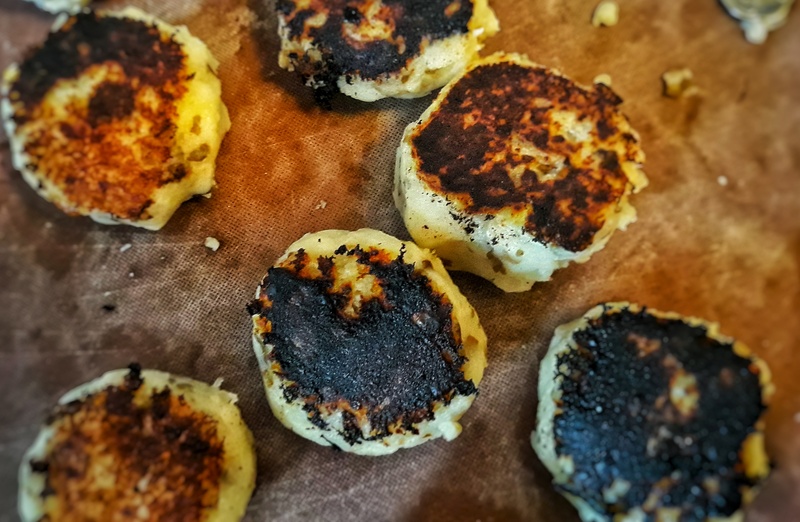 The humble dumpling still remained very popular though and became quite upmarket in rich households: they were enriched with ingredients such as butter, bone marrow and sugar. Fresh and dried fruits were also popular. King John (1166-1216), was a massive consumer of dumplings, and thought it necessary that on a Sunday every man in his court should breakfast on wine and dumplings. 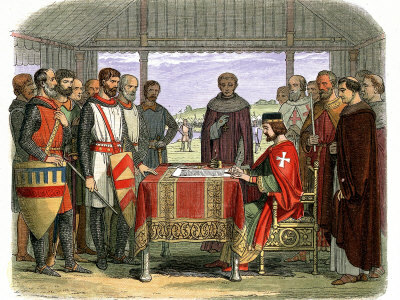 The king was advised by a Sir John and it was he who got King John into eating them. He was found out as a witch because he “had perform’d many Hellish and Diabolical Ceremonies”, including one that caused the king to think that the moon was made of green cheese. No-one seemed to blame the Magna Carta or the losing of the crown jewels on witchcraft though. His dumplings and puddings were so delicious that it was assumed that the reason for this but be that he was in league with the Devil. People soon realised it was because he put nice things in them, and forever onward, Sir John was named Sir John Pudding. These two Johns were Dumpling Eaters according Messrs Thomas Gordon and Henry Carey in their bizarre essay from 1726: A Learned Dissertation on Dumpling; Its Dignity, Antiquity and Excellence With a Word upon Pudding; and Many other Useful Discoveries, of Great Benefit to the Publick. Snappy title, eh? The original Dumpling Eaters, they say, were a race that split from the Romans during their British occupancy. When the Romans left, these Dumpling Eaters ‘wisely resolv’d never to go Home again’, because they had devoped such a taste for them. They spent their time eating many dumplings and worshipping the god Bacchus rather heavily, if you get my meaning. The Dumpling Eater Doctrine was still around in the early eighteenth century, where they could be found in their club house where they would eat ‘not only Dumplings but Puddings; and those in no small Quantities’. What became of the Dumpling Eaters, I do not know. I do hope there still an Order of them around. There are many recipes for dumplings around, both sweet and savoury. 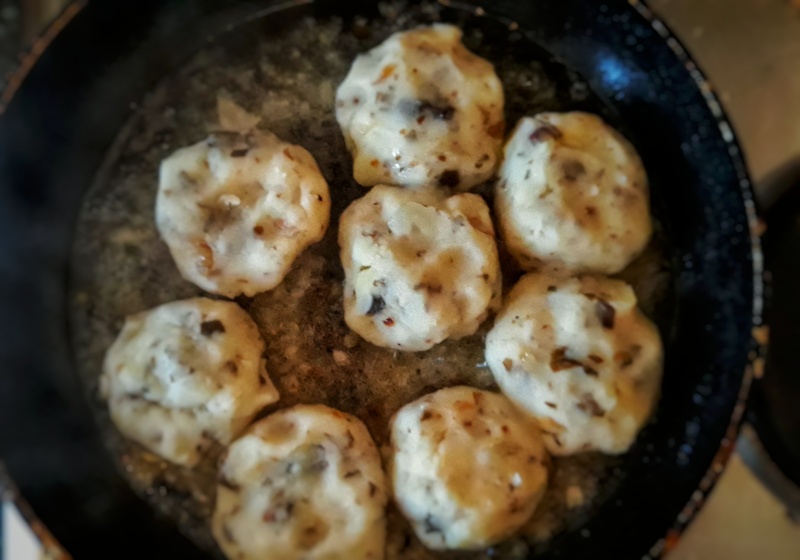 I thought I’d share this recipe with you for wild mushroom dumplings which I made not too long ago. At my local Farmer’s Market, there was a stall selling locally picked mushrooms and I couldn’t resist. I had some duck stock that I had made in the freezer (see this post for recipe), so I thought I would make a nice clear duck soup into which I could poach my dumplings. I shall give some more recipes for dumplings as I find more recipes for them. 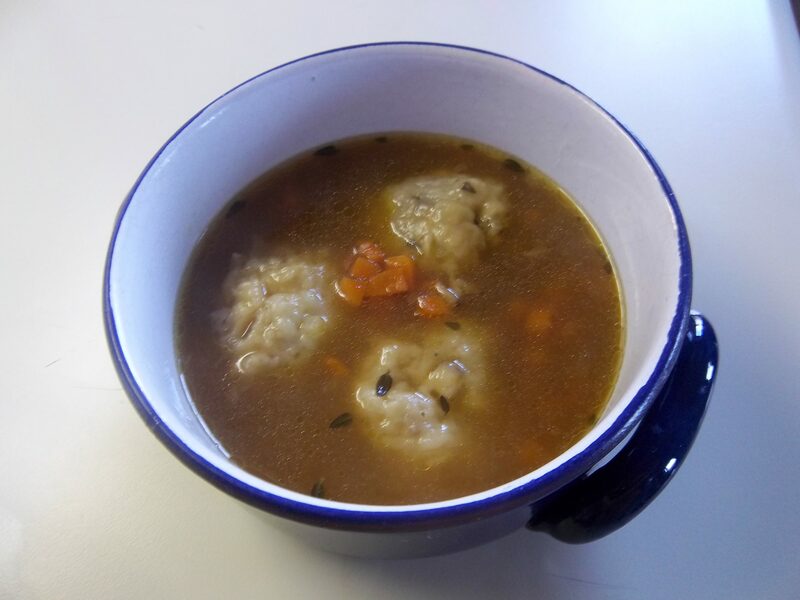 The soup is of my own invention and the dumplings recipe comes from the always excellent Lyndsey Bareham. 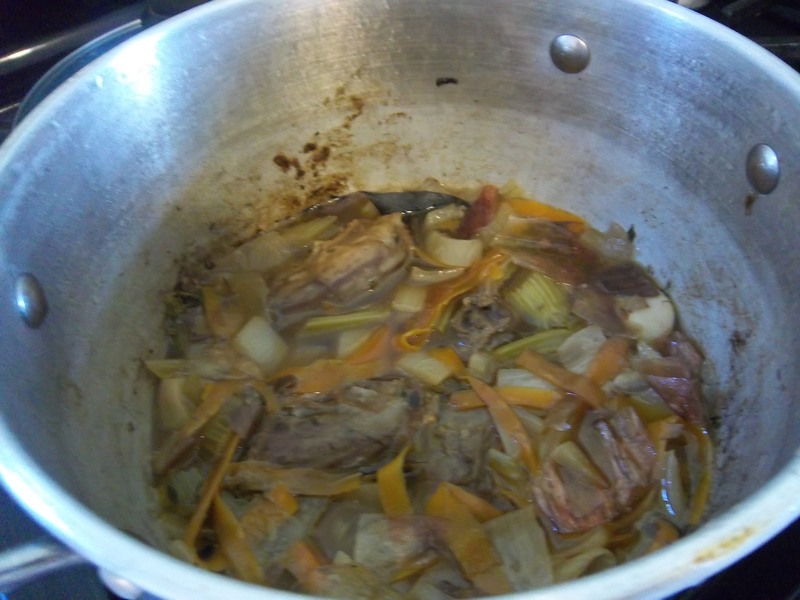 To make your duck stock clear, you need to clarify it. There are many ways to do this, but by far the easiest is to freeze it and then wrap it in a piece of muslin or a cloth and allow it to defrost slowly in the fridge. 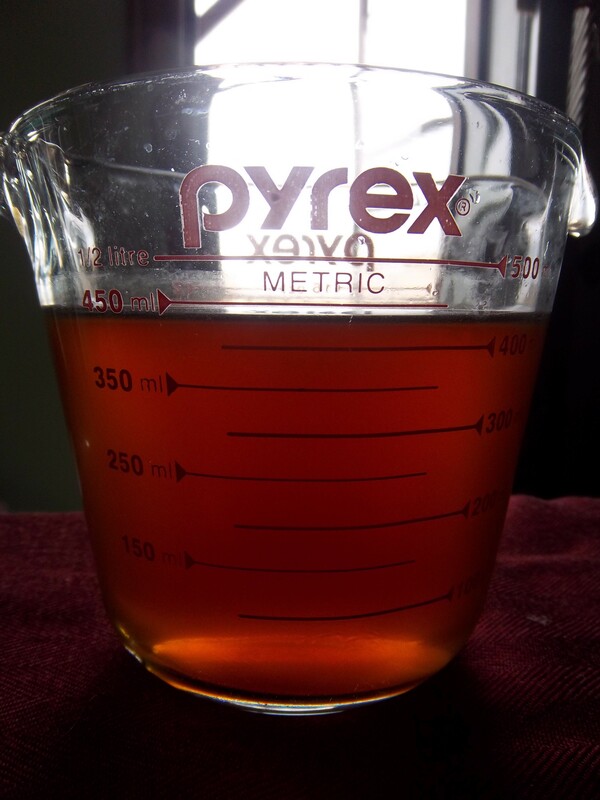 You should find that the stock that comes out is perfectly filtered by the cloth. You’ll also be surprised at the solid bits left behind in the cloth. 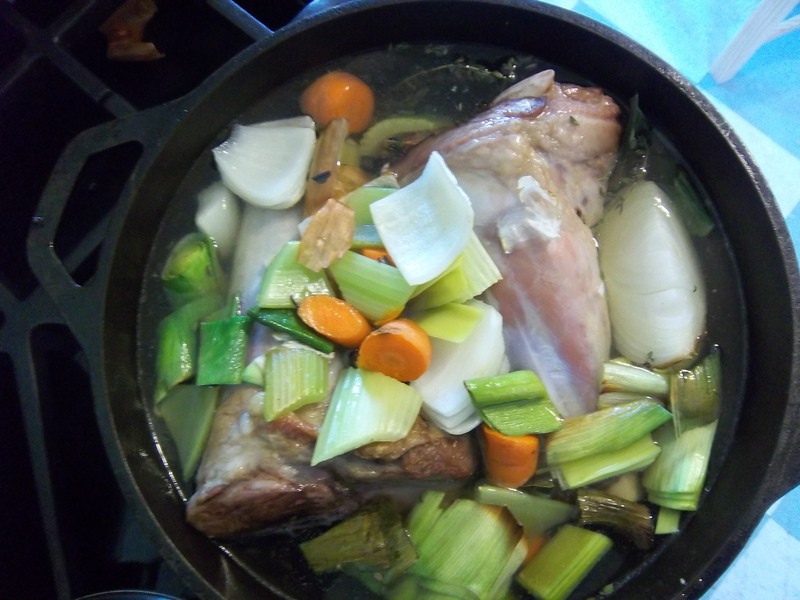 Anyways, pour the stock into a pan along with the carrot, thyme and bay leaf. Bring to the boil and allow to simmer for around five minutes. Season with salt and pepper. During the simmering time, whip up your mushroom dumplings: mix together all the ingredients in a bowl and mix in just enough water to make a soft dough. 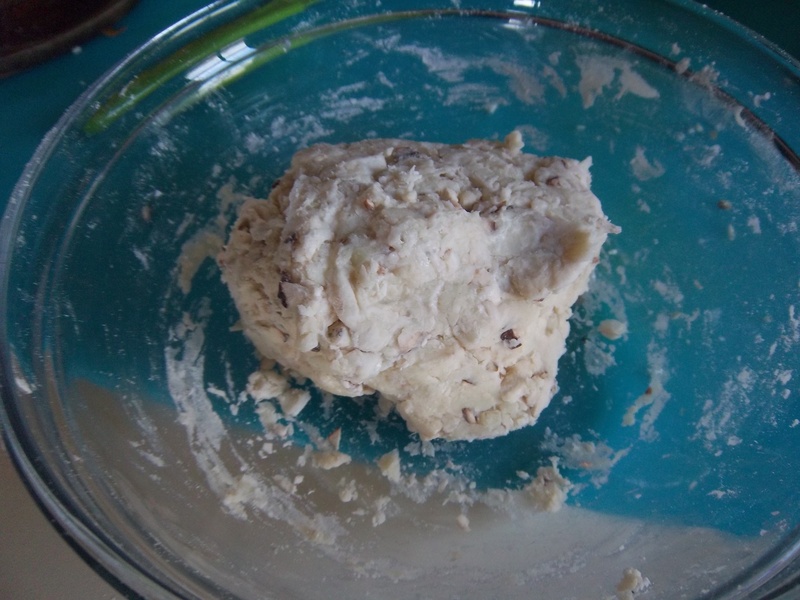 Take pieces of dough and roll them into balls a little smaller than a walnut. 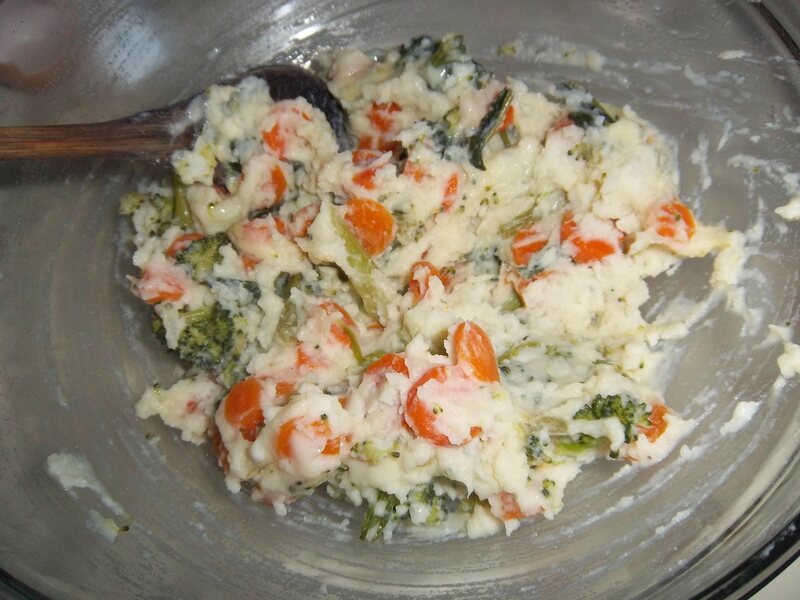 Place the dumping in the simmering soup, turning up the heat so that they cook through. They should be done in no longer than 15 minutes. Bora: Why in the middle I would have a rich favoury foup. Lazar: Made with Craw-fifh – Good! Bora: At the top two delicate white Trout just frefh from the river. Lazar: Good! Excellent! go on go on. Bora: At the bottom – a roaft Duck. 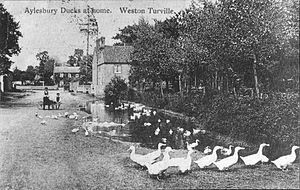 Okay, not everyone likes duck, for those that do, the best way to show it off, whether Aylesbury or whatever, is to roast it, seasoned with just salt and pepper. 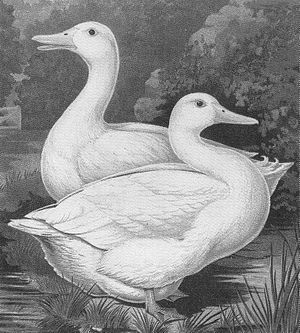 It’s also the most common way to serve duck. I did look at old recipes for it, hoping to find some crazy over-the-top recipe with many embellishments, but, alas, it was not to be: at best, there was a stuffing. Keept it simple, chaps. It did seem very common to scald the bird in boiling water for a few minutes before roasting it, though modern ones don’t seem to (unless, that is, you are making some Chinese crispy duck – that requires a kettle of boiling water to be poured over it and then drying it thoroughly to achieve the crispy skin). 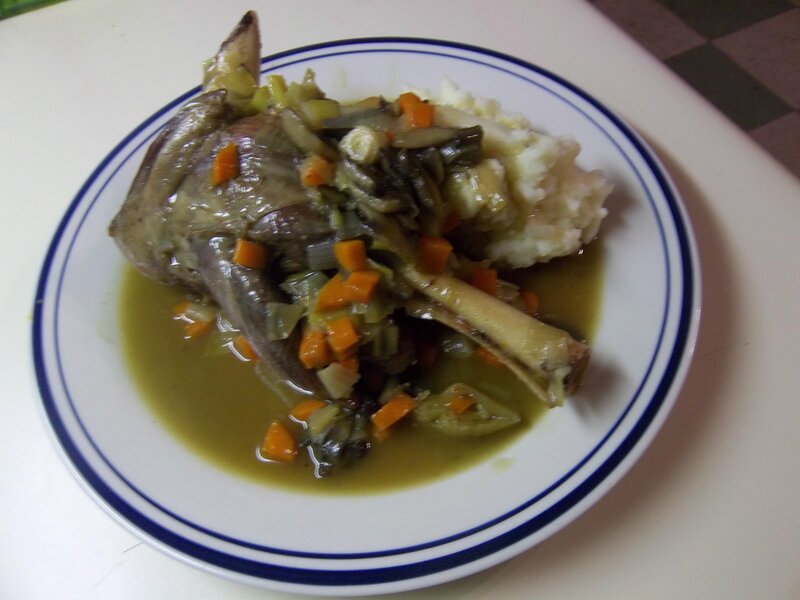 One of the great things about buying duck is that they always come with their giblets, unlike many chickens these days, so put them to good use. 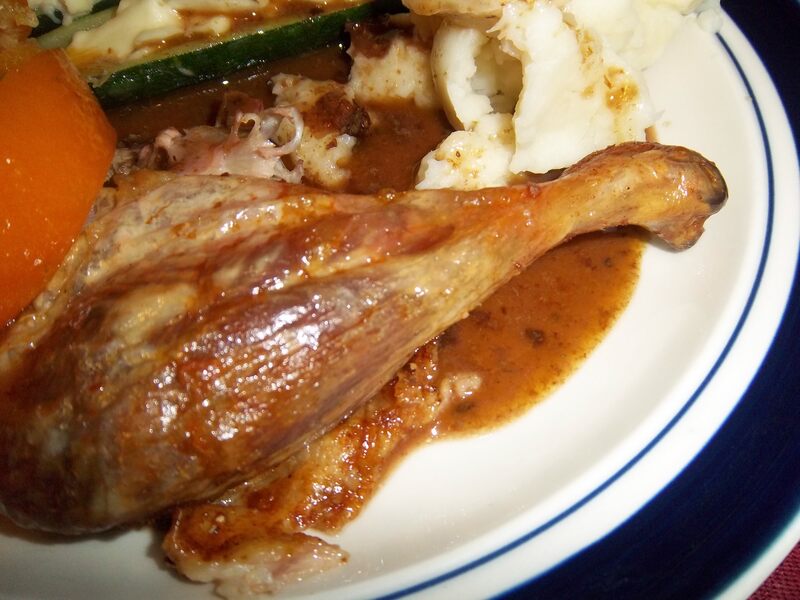 I have included a recipe for some nice rich giblet gravy to go with. First of all, place the duck on a large plate and dry it all over with kitchen paper and keep it in the fridge until it is needed. It is important to take it out of the fridge a few hours before you want to cook it though – when you are following roasting times for any meat, it is assuming the meat starts off at room temperature. The first thing you need to do is get started on the gravy. 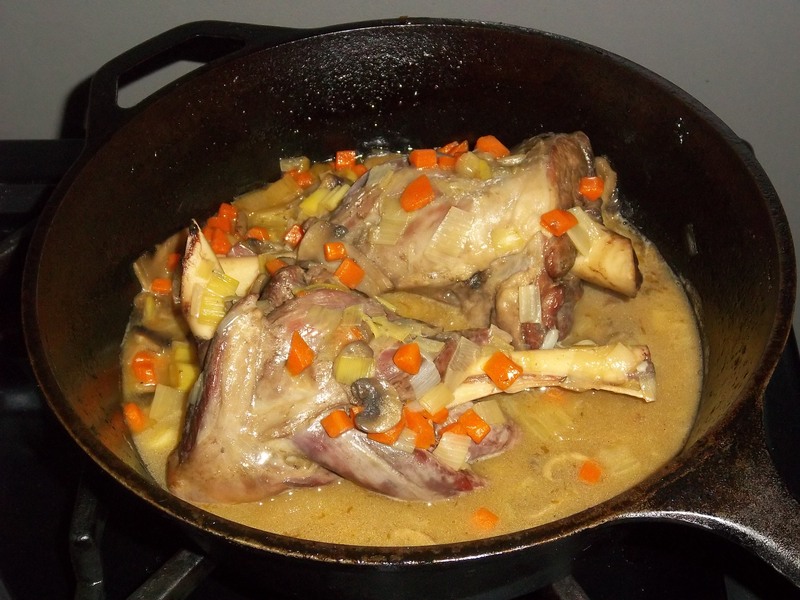 Get a pan nice and hot, add the oil, giblets and stock vegetables, when they are good and caramelised, add the herbs and peppercorns. Pour over a pint of water, cover, bring to a boil and then let it simmer gently for the length of time it takes for you to cook the duck. Preheat the oven to 220°C (430°F) and calculate the cooking time for your duck: 25 minutes per pound plus an extra 20 minutes. Using a fork or skewer, prick the fatty parts of the duck, i.e. the breast and the area where the legs meet the body. Make sure you prick only the skin – if you stab right through the fat, you’ll lose meat juices, and we don’t want that, now do we? 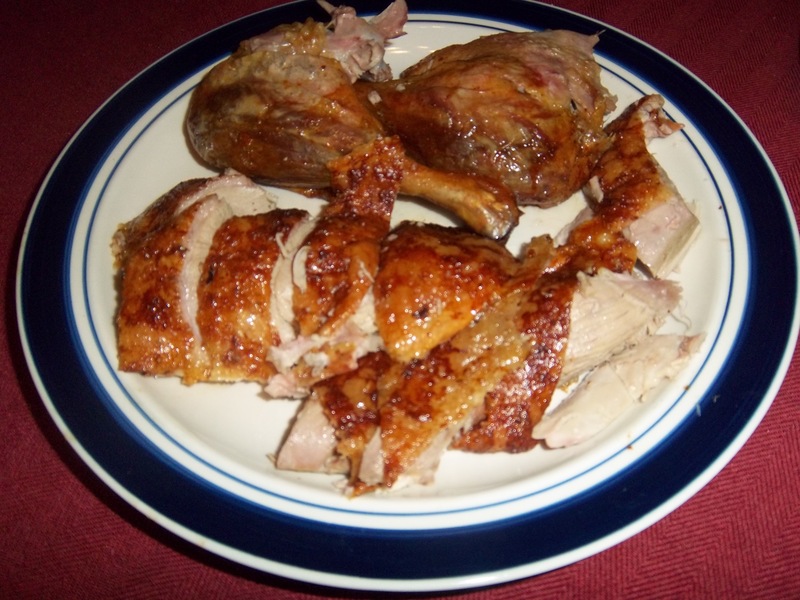 Season the duck inside and out with salt and pepper, place in a roasting tin with a rack, and pop it in the oven. After 20 minutes, turn down the heat to 180°C (350°F). After the first 45 minutes or so, baste the bird and every 20 minutes thereafter. It is important to do this if you want good, crispy skin. To test if the duck is done, poke a knife or skewer into the thick part of the leg and if the juices are clear, then the duck is ready. I would check it around 20 minutes before the total cooking time. 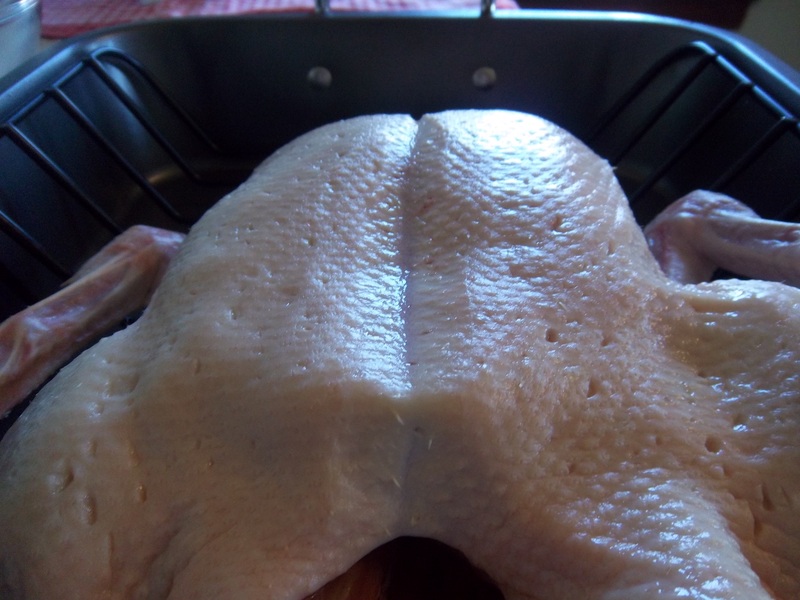 When cooked, remove from the oven and let rest for at least 15 minutes before carving it. Whilst the duck is having a rest, finish off the gravy: strain the stock through a sieve into a jug. Pour off any fat from the roasting tin and pour the meat juices into the gravy. Don’t you dare throw that fat away! It keeps in the fridge almost indefinitely, and you can use it for roast potatoes (they will be the best roast potatoes you have ever made).Put the roasting tin on the heat and deglaze it with the red wine, making sure you scrape off all the nice burnt bits. Tip that into the gravy too. 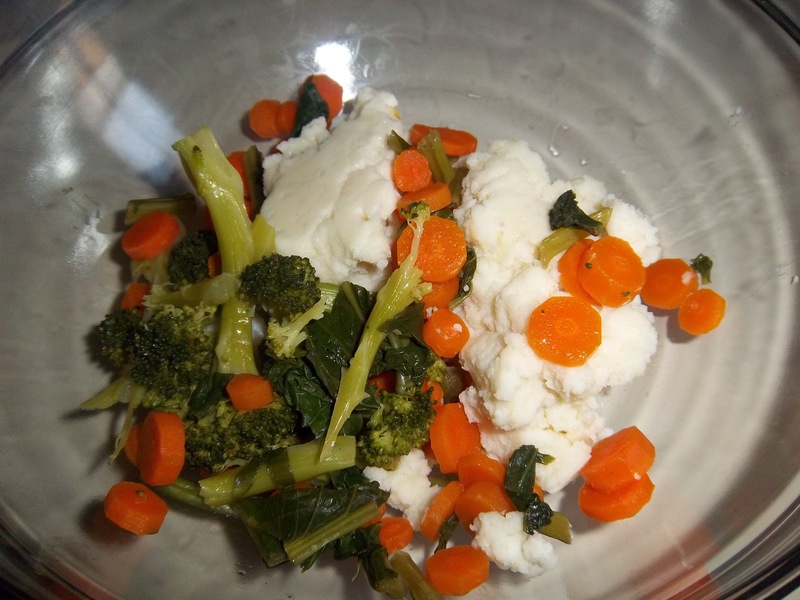 Melt the butter in a small saucepan and when it begins to foam, stir in the flour and cook for a minute. Now whisk in the gravy and let simmer for about 15 minutes. Finally stir in the jelly or orange juice (or even better, the syrup from some preserved oranges – see this link here for a recipe). Correct the seasoning and pour into a nice gravy boat or jug. There you go: a delicious, scavenging unclean bird!